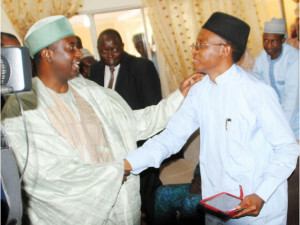 2015 polls: Kaduna politicians signs peace accord. In order to restore peace, orderliness and tranquillity to the already tensed political atmosphere in Kaduna State, political parties in the state has agreed to work together in restoring peace to the political environment. At a peace meeting in Kaduna yesterday, key members of ruling People Democratic Party (PDP), All Progressives Congress (APC) and other political parties who have candidates contesting for one position or the other, all denied to be part of campaign mayhems visible in the state in recent times. However, the organizer of the meeting called Kaduna State Peace Accord, Assistant Inspector General of Police (AIG) in charge of zone 7, comprising Niger, Kaduna and Abuja, AIG Patrick Dokumor, vowed to brought anybody caught to book no matter how highly placed such person(s) may be. According to AIG Dokumor, “Campaigns in recent times have been characterized with violence. Election should seen as a game where no one uses weapon or unleash terror on another. “This country is greater than any individual or group. Therefore, no group of people will be allowed to set this country ablaze. We will not spare anybody. Whoever it may be, we will not tolerate that any longer,” he promised. Addressing the participants, Governor Murkhtar Ramaln Yero who said the peace pact was in the interest of the people, appealed to other parties candidates and their supporters to warn their members against destruction of his posters, saying, election as far as he is concern was not a di-or-die affair. According to him, “I will like to register here that APC has finishes its campaign but we still have four local governments to cover in our statewide campaign. “We are aware of the tactics they have been using against us. But we should respect what we have come to do here. We will replace our posters and we do not expect anybody to remove them. “Anybody who know how I became governor will know that it is only God that gives power to whom He wishes. If Mukhtar is not elected, I will support whoever emerges. So to me, election is not a do-or-die affair,” he reiterated. Addressing newsmen shortly after signing the peace pact document, APC gubernatorial candidate in the state, Mallam Nasir El-Rufai, described the initiative as a welcome development, promised to play his own role at ensuring peaceful conduct of campaigns and elections. The former FCT Minister however urged Independent National Electoral Commission (INEC) against any attempt to further extend the reschedule election even by one day, quickly added that such attempt may trigger violence in the country.